My sister-in-law, Trish, is my new hero! 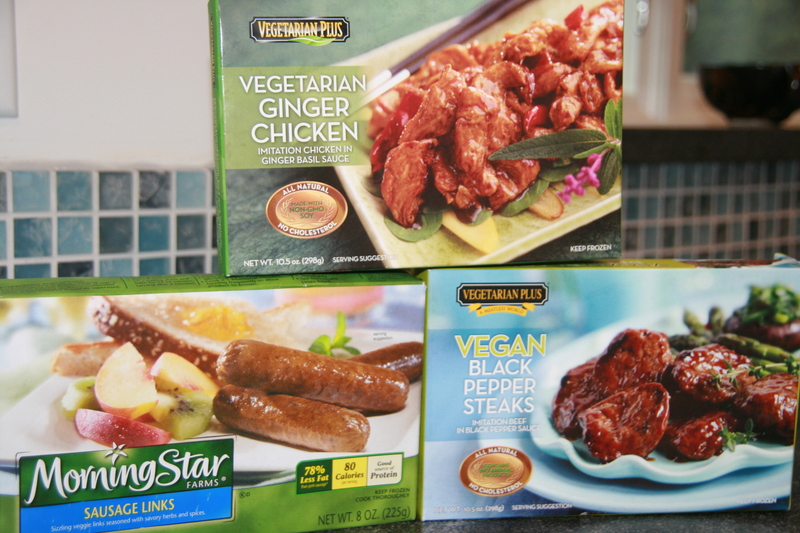 She’s been trying to incorporate a few vegetarian meals into her family’s weekly lineup, but according to Trish, her husband is “harder to please than John since he’s not very open-minded.” Faced with this dilemma, Trish resorted to an ingenious deception: without telling her family, she used Trader Joe’s “Beefless Beef” in their taco dinner. Much to our mutual shock, it escaped detection! Holy guacamole, these are Philly cheesesteak eaters! And they didn’t notice a thing! That got me to wondering: do carnivores freak out about fake meat because of their preconceived notions about it? The only way to test this theory was to try it out on my carnisaur. 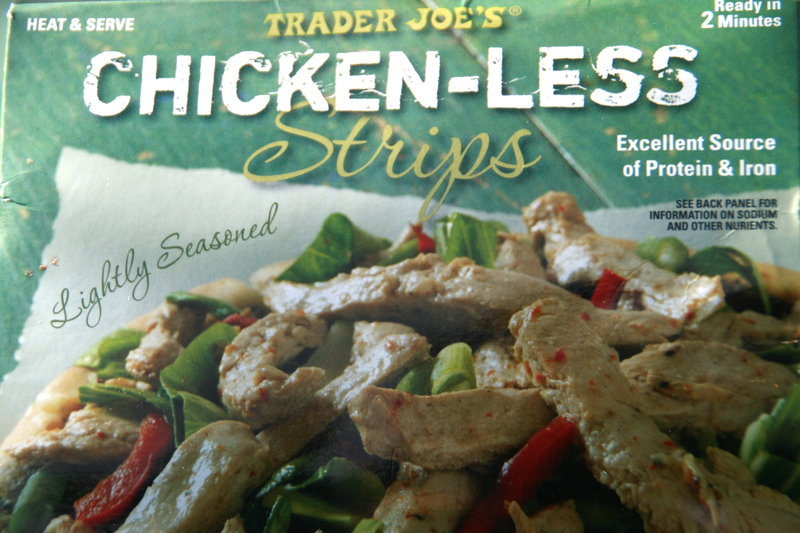 So off I went to Trader Joe’s to pick up their “Chicken-less Strips” and sneak them into a saucy dish in which John normally has real chicken. Since I’m still trying to ease him into this whole veg thing without freaking him out (or worse: risk him declaring an “all-meat diet”), every four days or so I make him a meal with chicken. Last night was his chicken night and he was really looking forward to it. So tricking him with he Chicken-less strips made me very nervous because if he figured out that I’d swapped in a fake, much bitching would ensue and he’d poke at every future meal and forevermore ask “are you trying to slip me some weird tofu thing?” That fate must be avoided at all costs, so yeah, my hands were shaking a bit. But then a miracle happened: before I had a chance to put the “Chicken-less Strips” in the sauce, our cat Mango jumped up on the counter (bad kitty!) 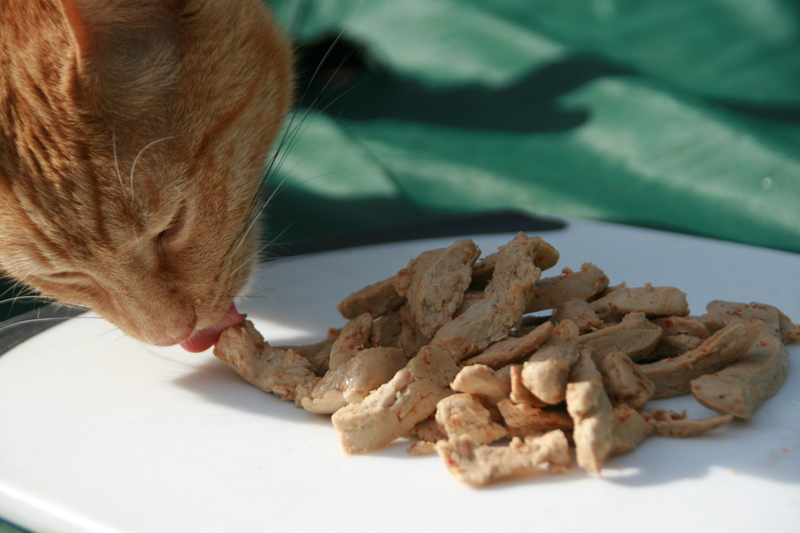 and started snacking on the fake chicken (good kitty!) I couldn’t believe my eyes. Right then and there I knew that this boded very well for my impending deception. 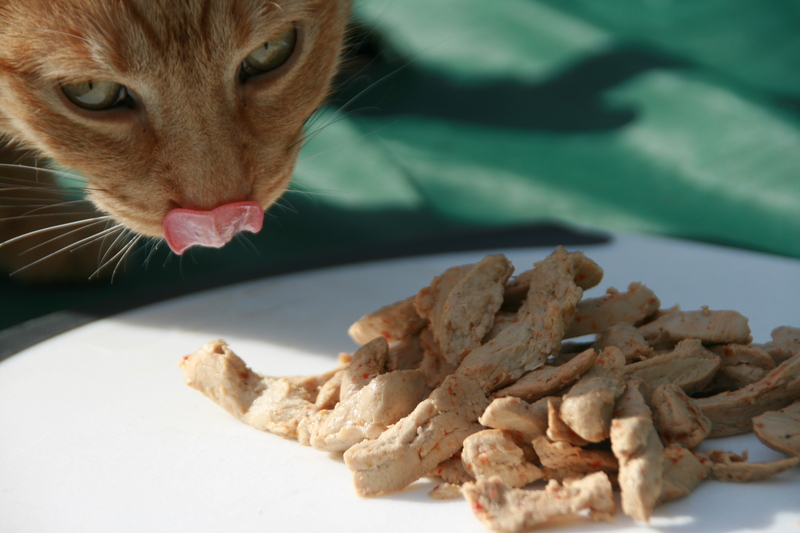 I mean, c’mon, cats are genetically hardwired to be carnivorous and they have a sense of smell that’s infinitely more acute than humans, and Mango couldn’t tell that this was faux chicken! Well hallelujah! And so I tossed it in the sauce without a second thought and tossed out all my nervous concerns (well, except the one about whether or not I mistakenly tossed in the strip that Mango had just licked.) But I did double-check the package to make sure that it was indeed fake chicken, and yep, it is! It’s quite healthy too, with 20 grams of protein in just nine little strips and it’s made from real and recognizable ingredients. Thanks for the inspiration, Trish! Review: John liked it and said he’d eat it again! I also liked it – good flavor, decent texture. Worked very well in stir-fry. I nuked it first, then tossed it in the stir fry once everything was cooked and ready to serve. Verdict: Blehkk. Avoid like a flesh-eating bacteria. Review: It was just all-around wrong. The texture was kinda squishy and the flavor was weird, even though I marinated it in fajita sauce for a couple of hours. I tried it in fajitas and John, our friends and I all picked around the ‘beef’ tips since the vegetables were way better. Review: I used this in a vegan white bean quesadilla and John really liked it! I even liked it, which is saying something since I had never tried chorizo before and the thought of a vegan version scared me. One note though: if you want a chunkier consistency, don’t add it until the dish is damn near done. I added it while I was simmering and blending the other ingredients and it just broke apart and blended with everything else. Is real chorizo supposed to do that? Who knows. But I have a feeling that this will maintain a chunkier texture if you add it only at the end. Review: This cardboard-textured ‘food’ (how can it honestly call itself food?) damn near permanently derailed Operation Carnivore Conversion. I tried it in a super flavorful Thai red curry but both John and I nearly gagged when we tried it. Review: John really liked it and said he’d eat it again, but he says that it needs to be on his fork with some other form of breakfast food. I tried it and, well, I suppose I’m not a good judge since I hated ‘the real thing’ when my parents forced me to eat it during my childhood. I didn’t like this fake sausage very much since it had too much of a meat-like texture for me and the flavor was sorta meaty too – yuck.